For Replacing One or More Missing Teeth, We Do It All Right Here Under One Roof! Long Beach dentist Dr. Marvizi will restore your smile and chewing ability with dental implants. For single or multiple tooth replacement, no other solution is more durable and more lifelike than custom-designed dental implants here in Long Beach. Dr. Marvizi Will Restore Your Smile In Just One day! With our same-day dental technology, you can walk in with missing teeth and in a matter of hours walk out with a fresh new smile. At our hi-tech dentist office in Long Beach, we use Cone Beam technology to produce three dimensional (3-D) images of your teeth, soft tissues, nerve pathways and bone in a single scan. How Do Dental Implants Differ From Fixed Bridges? An dental implant is just like a natural tooth, with a “root” part and a tooth part, so it feels and functions like your natural teeth. You also care for a dental implant the same way you care for your natural teeth, with regular brushing, flossing and dental appointments. Unlike fixed dental bridges which can be difficult to maintain and can also place strain on the teeth used to support them, dental implants feel, look and perform like your natural teeth, and patients find they’re much more comfortable than dental bridges. If you have an uncomfortable or loose-fitting denture, Dr. Marvizi can give you dental implant supported dentures for both the upper and lower teeth which are more comfortable and functional. You’ll be more confident when you talk, laugh and eat at restaurants because they won’t slip or fall out. Because they’re securely attached in your mouth, there is less gum irritation and best of all, with implant supported dentures, there is no need to use denture adhesives. How Long Will My Dental Implant Last? Dental implants are designed to last as long as your natural teeth, and just like your natural teeth, they require regular brushing, flossing and dental visits to stay healthy and strong. Dental Implants are Dr. Marvizi’s #1 treatment option for replacing missing teeth. To find out more about our Dental Implant services or the other dentistry services we provide, please call our Los Angeles dental office at 562.595.4123. Contact Dr. Marvizi for a Complimentary Dental Implant Consultation. 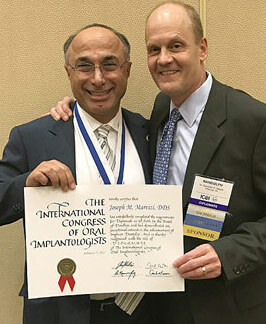 Dr. Marvizi has been awarded the advanced status of Board Certified Diplomate by the International Congress of Oral Implantologists (ICOI) for his outstanding work and expertise in the field of implant dentistry. Board Certified Implantologist for dental implant surgery and restoration.